A Monarch butterfly on Red Tropical Milkweed at Grapevine Botanical Gardens in Texas. Photo courtesy of Ken Slade via Flickr. Every winter, the mountain forests of central Mexico become the home to monarch butterflies (Danaus plexippus) who travel an amazing 3,000 miles across the U.S. to reach their destination. But a report released this week by the World Wildlife Fund and Mexican government agencies warns that the number of monarchs wintering in Mexico has reached its lowest level since the migrations have been studied. One of the primary reasons for the monarchs’ drastic decline is the widespread use of herbicides in American agriculture, which destroys milkweed plants, the monarchs’ only natural habitat and food source, in alarming numbers. Many different species of native milkweed provide nourishment for monarchs, including swamp milkweed, green, purple, redwing, whorle and horney spider varieties. But one of the most common and numerous is the butterfly milkweed (Asclepias tuberosa). According to the experts, milkweed sap is actually poisonous. The monarch larvae that feed on milkweeds ingest and sequester the toxins in certain parts of their bodies, which repels predators like birds (as soon as they pounce on the larvae, they quickly spit them out because of their foul taste), a biological defense mechanism monarchs keep throughout their life spans. 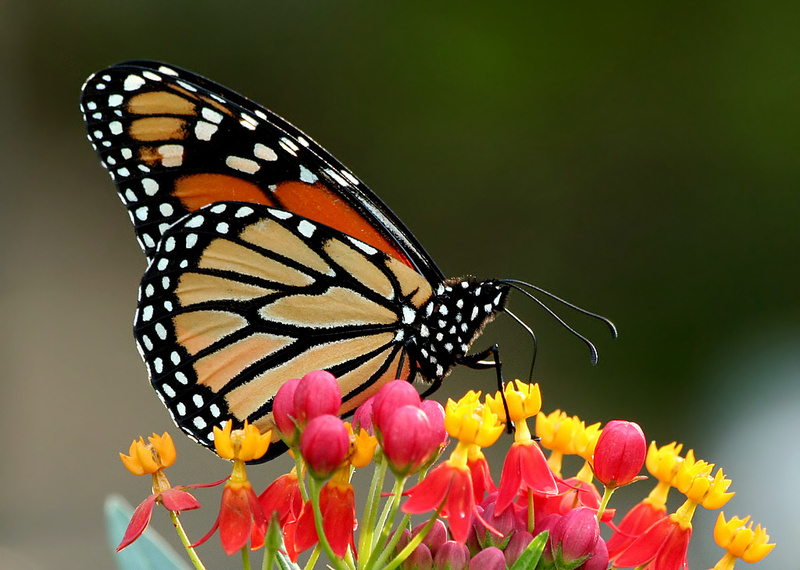 The offspring of monarch butterflies that lay eggs on milkweed across the U.S. will eventually fly south to Mexico. This means that it is crucial to help those that do survive over the winter by providing more food and habitat so they can reproduce come summer. So, instead of cutting down the native plants and removing them from roadsides and fields, we can all do our part by plant more milkweed and reducing our use of detrimental herbicides. For more information on what you can do to foster the relationship between monarchs and milkweed, visit the website of Monarch Watch. This entry was posted in Attract Butterflies, Uncategorized and tagged beneficials, butterflies, butterfly, butterfly population, farming, garden, gardens, insects, milkweed, milkweeds, monarch, monarch butterflies, monarch butterfly, monarch larvae, monarch population, Monarch Watch, pollination, pollinators. Bookmark the permalink. Quite by accident, I’ve found that Mexican Torch Sunflowers are attractive to the adults. We had numerous visiting Monarchs late last summer. Last summer I ran into a couple on a prairie who have been finding, rearing and releasing monarchs for years. I commented that I had only seen one that entire day and they said the numbers they have been able to find have dropped precipitously. It’s frightening to think such an iconic insect could just disappear.